Friends, fans, and family! 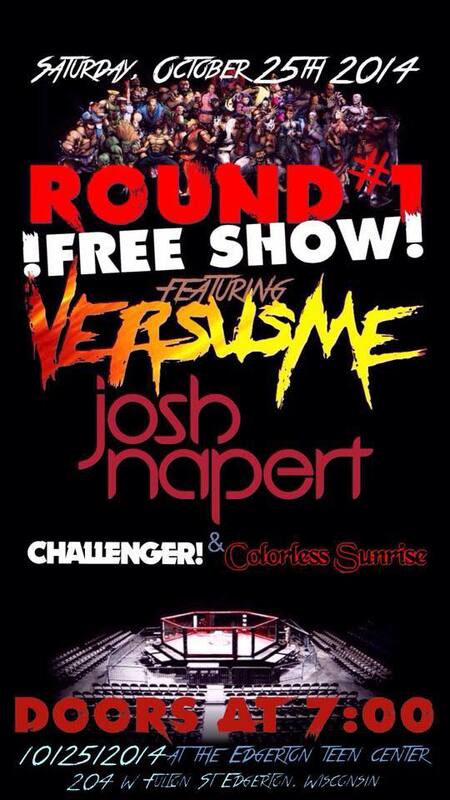 I will be playing a FREE show NEXT SATURDAY in Edgerton, Wi at The Edgerton Teen Center with my good friends Versus Me and CHALLENGER! along with Colorless Sunrise. Having produced both Challenger! and Versus Me, this show is an honor to be a part of. This will be Versus Me’s very first public show, so DEFINITELY not something you want to miss, along with a chance to stock up on their first set of t-shirts and other merch, as well as a pre order for the album. Trust me, you need to get on that. Challenger! will be bringing you the very best of his studio albums and will be tearin’ it up like always! I’m also super excited to watch Colorless Sunrise kick off the night and see what those guys can do :). Feel free to comment or message me on my Facebook or Twitter for any details! This show is going to be an absolute blast… I hope to see everyone there!